This summer, traveller’s transferring and flying to and from Dubai can clap their eyes on this amazing Milka custom POS Display in Dubai International Airports Duty Free. Milka is a beloved chocolate brand all over the world which belongs to one of the world’s largest snacks company’s Mondelez. This POS Display is shaped like their loved mascot cow, ‘Milka’ – a symbol of their brand. This purple cow is shown on the packaging of all their chocolate and appears in TV advertising, and that’s why everyone can easily recognize this brand promotion. 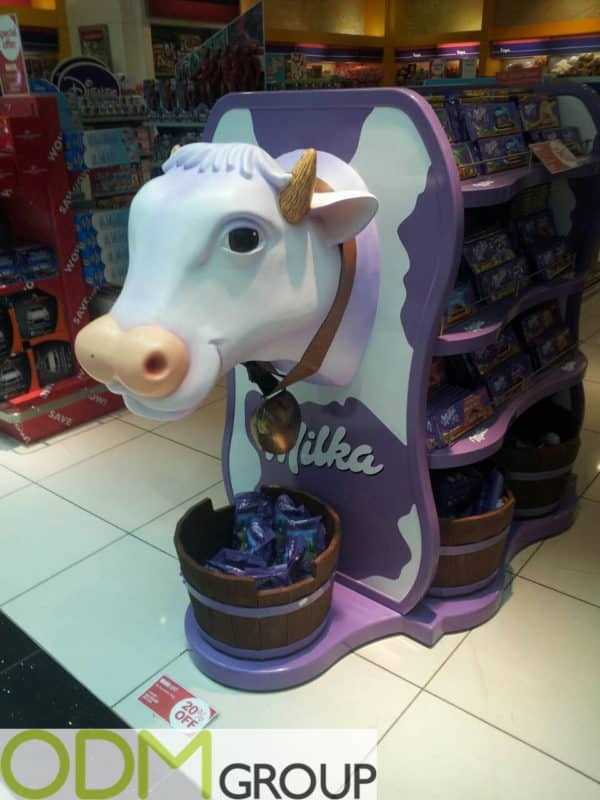 Why this Milka custom POS Display is a really effective promotion? Unique but Effective. This is not just a cardboard point of sale stand, it is a plastic cow shaped display. This large purple cow which, when placed in store will never be unnoticed. In this case Milka producers can catch customer’s eyes and engage them to make an impulsive buy. Boost your Sales. This advertising display is presented with Milka’s famous product varieties. Everyone who wants to come closer and look at this famous cow, will be more likely to also take a look at Milka’s product range. They will also for sure take one or two of Milka’s chocolate bars to try, meaning this is a perfect promo idea to attract customers and increase product’s sales. Makes Brand More Important. Huge POS Displays provides a big branding area, therefore you have opportunity to place your brands logo, slogan, more information about the product, something interesting about the way of production, terms of promo campaign and of course samples of product. So this is the best way to communicate with customer. Finer Brand Remembrance. POS Displays like this are able to increase your brand value. It is impossible to be indifferent to this cute brands mascot. Seeing this Milka POS display you will automatically recognise this brand and if not, with a display so vivid and big you will easily remember it in the future. Here at the ODM Group we would like to offer you more ideas for your next promotion. Rely on our big sourcing, designing and manufacturing experience and contact us today.